My book club is going to discuss Ungifted by Gordon Korman. Though we are all adults, we're reading a YA book, so I have written some questions that seem usable by an adult discussion group. I enjoyed the book and found it very amusing. though somehow the questions seem rather serious. 1. Since we’ll get around to it eventually anyway, who wants to tell a story of their own Middle School/Jr. High experiences? A. If he would stay at the gifted school would it be good or bad for him? B. Why did Donovan’s sister feel so comfortable with the gifted kids? “And I couldn’t help thinking, No, it sure isn’t. You can see it in the paint job, and taste it in the bad cafeteria food. You can hear it in the dead air that hangs in the classroom when the teacher asks a question. You can smell it in the sweaty gym socks— so different from the synthetic-oil aroma of a set of Mecanum wheels.” (p. 215). A. 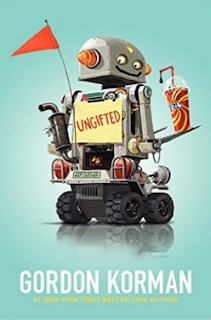 Do gifted kids in our society really get treated better to the extent that the book implies? B. In this and many other passages when Donovan describes the situation at the school, the relationships between the teachers and students, the attitudes and social pressures among the kids, and much more, he’s incredibly perceptive and his observations are amazing. Is this convincing? Is he a believable observer? 4. Did you find the portrayals of the kids/teachers/administrators excessively stereotyped? Is there balance between the predicted behavior of the “gifted” and the “ungifted” and their self-awareness as revealed in their alternating narratives? We are discussing this book in a 6th grade book club I lead and I really like these questions. Thank you for sharing them!